4 Reasons Why You Need an Intimidator | Intimidator Inc.
You may not know it right now, but you NEED an Intimidator 4x4 Utility Vehicle. From hauling hay to hauling a group of friends, Intimidators are second to none due to their American-made ingenuity, power, and performance. 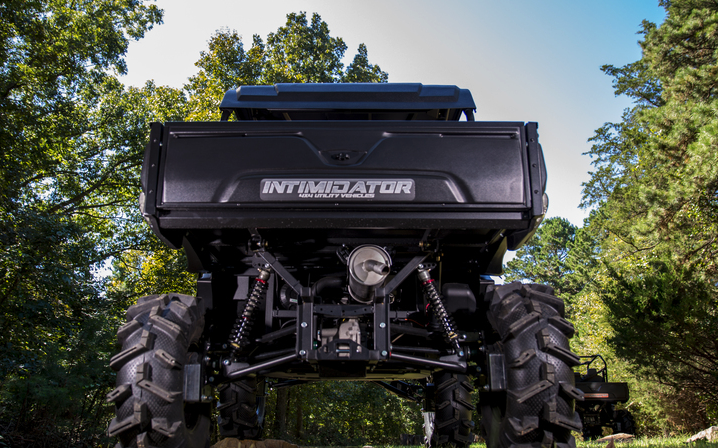 Check out four other reasons why you NEED an Intimidator. Not only were Intimidators built to be strong, but they were also built to be safe. While stirring up the dust, each passenger has a 3-Point DOT approved restraint belt to keep them inside the vehicle as they travel through curvy back-road trails. And just in case things get a little crazy, Intimidator has installed a 1.75'' diameter tubing, five piece ROPS (Roll Over Protection System) which is built and manufactured according to ROHVA (Recreational Off-Highway Vehicle Association) Compliance Testing. Headlights and tail/brake lights also come standard on every vehicle. It doesn’t get much safer than this. Intimidator UTV’s are just what you need to incorporate a little family bonding. The Intimidator Crew Cab Series is perfect for those who want to take along the entire gang. Key features of the Crew include premium bench seats with headrests for up to SIX adults. Don’t worry about weighing down this machine. The Intimidator Crew Cab Series offers a full-size bed that can hold up to 1,000 lbs. and has a towing capacity of 2,100 lbs. There is no doubt that these machines can handle almost anything you throw their way. If your work involves moving heavy items, like hay or gravel, then Intimidator has just the vehicle for you. The Intimidator Truck Series was built for hard workers in mind. Key features of the Truck Series include a 6-foot truck bed that conveniently folds down into an aluminum flat bed that can handle 1,200 lbs. cargo rating, premium bench seats with headrests for up to three adult passengers, and an overall 2,100 lbs. towing capacity. Adding an Intimidator Truck Series to your fleet will definitely help you to lighten the load and work a little faster so you can spend more time doing the things you love. Without a doubt, one of the best features of any of the Intimidator vehicles is being able to customize it and make it your own. In fact, when you go to www.intimidatorutv.com, you can BUILD YOUR OWN INTIMIDATOR by choosing the series, the power, the color, add-on packages, like the XD-4 and XD-Sport, and even accessories. There are even more accessories on Intimidator’s partner site…Bad Dawg Accessories. On Bad Dawg’s website you can get your rig even more customized by adding lights, a stereo, speakers, and so much more. Intimidator has been hard at work, and it has definitely paid off. If you haven’t seen the newest member, THE ENFORCER, then you are missing out. The Intimidator Enforcer ATV Series is stocked with the first ever SXS Gear portal lift on a factory option. And with Intimidator’s 800cc Gas Engine, you will be making dust fly as you race through the trails at up to 55 mph. Intimidator has also added the XD Sport package for the Classic Series. Did we mention that Intimidators make great gifts? Check out the full line-up at intimidatorutv.com. Make sure you LIKE our FACEBOOK page so that you are the first to know when new additions are added to the Intimidator family in 2017. We can’t wait to show what is coming next!